The #1 problem for most guitar teachers is attracting new students and keeping their schedule full all year. Study these resources to learn how EASY it actually is to attract guitar students like crazy. Learn more. Different guitar students have different mindsets when it comes to learning how to play. Learn how to identify the student type you are working with and get better results for them by watching this guitar teacher training video. Teaching sweep picking to your students requires understanding how to adjust various specific movements in their playing. While doing this, it is important to not let them interrupt you so you can better help them understand what to do. Watch this video to learn how to teach sweep picking to guitar students. Teaching advanced guitar techniques to students is a very rewarding process. To do this effectively, you need to understand the correct teaching methods AND get your students to practice correctly when they get home. Watch this video to learn how to teach guitar students advanced techniques. The easiest way to become a better guitar teacher is to learn from the mistakes of other guitar teachers and not repeat them. This helps your students become better guitarists, makes you stand out among other guitar teachers and helps you to earn a lot more money. Avoid these 15 guitar teaching mistakes. Using cookie-cutter methods for teaching guitar won’t help your guitar students become great players. Learn what to do instead to help your students progress faster and create your own highly effective guitar teaching methods. The single most important habit you can instill in your guitar students is the ability to practice guitar correctly and consistently on their own at home. 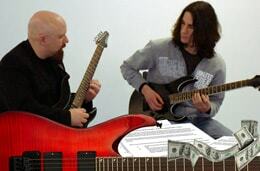 Read this article to learn 5 key ways to motivate your guitar students to practice. Want to transform all of your guitar students into awesome players a lot faster? Then you need to stop giving them “tons of stuff to practice” every single time they have a lesson. Instead, you must start training them so that they can creatively apply their skills and stop using inferior guitar teaching models. Find out how to do all of this and a lot more by checking out the points in this article about teaching guitar more effectively. Your guitar students don’t come to you for ‘guitar lessons’, they come to you with ‘problems in their guitar playing’ that they want solutions to. The mark of a great guitar teacher is the ability to diagnose and fix any problem your students have. Read this article to learn exactly how to do this so you become the most sought-after guitar teacher in your area. Get free 7-day coaching on how to turn your students into great guitarists faster, attract more highly motivated students into your business and grow your reputation around your city. These are things that other guitar teachers in your area do not know (and likely will never know). Get this mini course to learn how to be an excellent guitar teacher. Before you can improve your skills as a guitar teacher, first find out exactly how good you are in this moment at teaching your students. Take this guitar teaching assessment to evaluate your strengths and weaknesses as a teacher. After you fill out the questionnaire above, I will send you (for free) my written feedback about your answers and help you become a more effective guitar teacher. Learn 5 proven ways you can help your students get much better results from studying with you. You can easily implement these approaches into your guitar lessons right away to become a much better guitar teacher. How Effective Are You At Teaching Your Guitar Students To Practice? Your guitar students will not make a lot of progress in lessons with you unless you are highly skilled at teaching (and training) them ‘how to practice’ guitar correctly. Most guitar teachers take it for granted that their students will practice effectively on their own…and that is why their students do NOT make any real progress! Take the above test to find out how good you are at teaching your guitar students to practice. The ultimate "How to teach guitar" guide for guitar teachers. Discover the proven methods on how to teach guitar that destroy the conventional approach to helping guitar students become great guitar players. You'll also learn what to do if you don’t know what to teach someone, how to teach students at varying skill levels, and how to approach very difficult-to-teach topics such as scales and modes, improvising and reading music. I will also tell you about all the mistakes that guitar teachers constantly make when teaching, and why their students make slow progress as a result... Most importantly, you will learn how to avoid these mistakes in ‘your’ teaching, help your students progress faster, get them to remain your students for years and grow your reputation as the dominating guitar teacher in your area. Learn how to teach guitar the right way. In addition to learning how to effectively teach guitar, you must get real training on how to build and sustain every aspect of a massively successful guitar teaching business. Learn how to make 6 figures per year teaching guitar, work (a lot) less than 40 hours per week, help your students become great guitar players and live the life you’ve always dreamed about. Sounds unrealistic? Many of my Elite Guitar Teachers Inner Circle members are doing it, and they got that result by using my proven and extremely effective strategies and methods. Becoming the most successful guitar teacher in your area is DEFINITELY within your reach, and if you are committed to getting this result - I will commit myself to getting you there. Read this page about guitar teacher training.